1. Bake the sourdough with a little olive oil and Maldon salt in a hot oven until golden. 2. Trim the spring onions and grill on a hot cast iron grill or barbecue until nicely charred all over. Place in a bowl and cover with cling film to wilt gently. 3. Finely slice the remaining spring onions and reserve. 4. Thoroughly rinse the preserved lemon and scoop out the flesh to leave just the thin yellow rind. Finely chop the lemon skin and add to the sliced spring onions with the diced red chilli, coriander and fresh lemon juice. Stir in the extra virgin olive oil and taste for seasoning. 5. Slice the squid tubes into rings and cut each set of tentacles in half. Heat a heavy frying pan until smoking hot then quickly add a splash of oil and half the seasoned squid. Cook the squid only very briefly, in batches, for at most twenty seconds each time. 6. 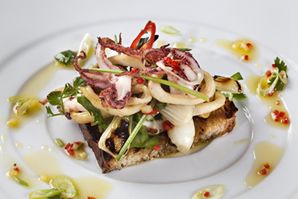 Pile the grilled spring onions onto the toasted bread followed by the squid. 7. Spoon the vinaigrette generously over the squid and grilled onions and serve immediately.